TheWoodHaven2 • View topic - Bandsaw blade bearing? Is this called a bandsaw blade bearing? I got an Elektra Beckum 315 bandsaw a little while ago, came as a job lot and the bandsaw has had a fairly hard life, lots of surface rust on the casing and paint etc. Not sure where it had lived previously! Anyhow it works well but this lower bearing has seen better days. I can’t find a new one to buy online? Struggling and wondered if someone could point me to a company? I know you can get upgrade kits which look lovely but at £60-70 they’re beyond my budget and I just want to get it working properly as is. If it’s ball bearing they are cheap to replace, that or free the old one with some oil. Are bandsaw bearings the same size as skateboard bearings? That's the thrust thingamethig which stops the band being pushed backwards by the work. I reckon it's getting towards the end of its useful life, myself. Malc2098 wrote: Are bandsaw bearings the same size as skateboard bearings? Sometimes but in any case ball races in most sizes are super silly cheap on ebay. you don't need a top quality high precision bearing for bandsaw guides. I have a EB 315, I will have a look at what's on mine, tomorrow. I am sure it's a standard ball bearing just mounted on a shaft that slides in the mount on the saw. 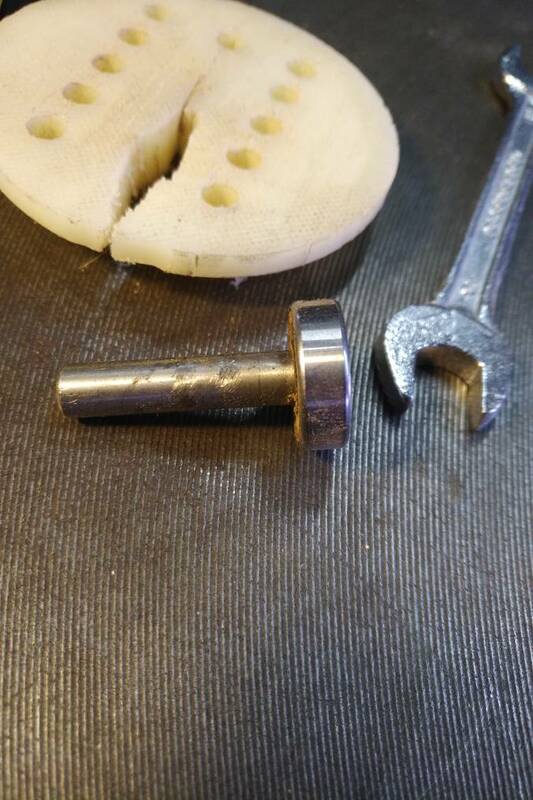 NEVER EVER buy replacement bearings from the machine manufacturers as spare parts. They will be vastly over priced. Virtually very manufacturer uses standard size bearings as bought in parts. Bearing manufacture is a specialist business and woodworking machine makers are not going to make their own. To find a replacement bearing, measure the Bore, the OD and the width. If you measure in millimetres and the numbers are coming out at non integral figures convert to fractional inches and the number should become more sensible. such as 6003 say. bearing with metal shields over the balls will have a suffix 2Z or ZZ. Ones with rubber seals which are generally best for woodworking machines have suffixes of 2R or RR. So 6003-2R would be the type to go for. And presumably drift the central pin out ? RogerS wrote: And presumably drift the central pin out ? Pressing it out in a vice or press should work. Hammering should be avoided as percussive methods will flare the end of the shaft and jam it in the bearing. If the op needs a new spindle making they can send me the old one and I can make a replacement. A great tip I was given when replacing some bearings was to place the shaft in the freezer overnight & keep the bearing somewhere warm, I was a tad sceptical but in the morning the two parts went together a breeze. 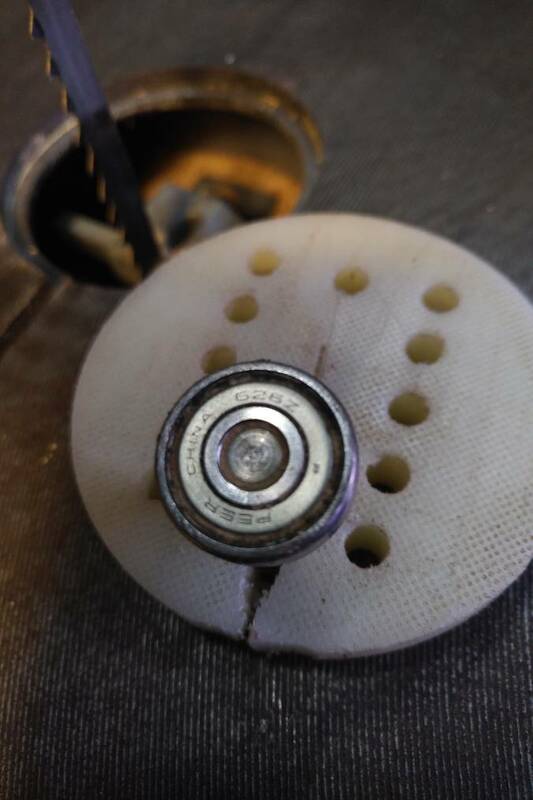 Doug wrote: A great tip I was given when replacing some bearings was to place the shaft in the freezer overnight & keep the bearing somewhere warm, I was a tad sceptical but in the morning the two parts went together a breeze. An often used dodge to get bearings into old British bike engines without hitting them, one of my mates used to put the crank cases of his triumph in the dishwasher, while his wife as out. My old BMW R50 manual says heat the bearings up to 100degrees C to fit them over a shaft, or heat the housing they're to fit in to 100. In the 60s I used to watch this old BMW engineer sitting there with a blow lamp spit on them. If the spittle vaporised, he knew they'd reached 100 degrees. Here is the bearing from my 315. It's 626Z and they are easy to get hold of. It's just pressed on the shaft, easy to change with a socket to support the bearing while using a machine screw to push the shaft out in a vice. Thanks Dave, that’s really helpful having something to compare too. Out all evening so couldn’t go and measure but I will tomorrow. The help and advice on this forum never ceases to amaze. Thanks all! Roller bearings aren't designed to be used like that but sadly it's a poor design used by several manufacturers. If you look at the Axminster and newer Record Power bandsaws they have a properly orientated rear bearing. My bearing arrived yesterday and is refitted on the saw. Thanks all!